But hor...when we arrived at the airport....saw this sign...No waiting, check-in, toilet. Hmmm........not check in for boarding the plane meh? Where to go ah? No more gang liao...so quiet...Near lunch time already. Mamarazzi said before going back, she HAD to makan one more round her favourite food in Sibu. Can you guess what? Papa pulak crazy about their Otak-Otak. As for me, of course lah this one. Saw the Boss sorting some fried Peanuts. I managed to bodek the Boss to let me have some. The Boss really clever wor coz he went and asked Papa and Mamarazzi whether can give some to me. Must be worried that I might be allergic to peanuts. The other day SK commented Mamarazzi did not post up much photos of this Payung Cafe. Well, here are some of them. Told you that Mamarazzi not good at snapping photos of decoration lah. After having a heavy lunch we went back to the hotel for a rest. The hotel let us check out late at 3pm. Cham lah...our flight was night time. Where to hang out ah? Papa drove us round Sibu Town. All the time..he was thinking of the Sago Worms. How to "export" some back to KL?? Then Mamarazzi thought of the plastic container that Uncle Arthur pass to us when he pass us the Quinine Mango. Hmmm...can put the worms in there wor. Poke a few holes...them should be okay gua. We head on to the Market. Bought RM20 of the worms and put into the plastic container and big box. Surprisingly, most of the worms survived to KL. However, the Midin that Mamarazzi bought did not survive. While at the market, Mamarazzi spotted these toys. Bought it for me. I had a nice surprise when I woke up from my nap in the car. Despite the shopping, there was ample time left. Papa was feeling rather sleepy. Hence, he drove to Sg Merah to have Kopi-o there. I was hungry. Hmm...don't know why I kept wanna eat when I was in Sibu. Papa got me some Kolo Mee. Taste not bad la. Finished the whole bowl. It was at Sg Merah that Mamarazzi's camera ran out of battery. Had to depend on phone camera. While digging in the car, Mamarazzi noticed the "breakfast" that we missed. That morning, Uncle Arthur bought a lot of Kuih Muih for us. Got Roti Telur. Surprisingly it was still crunchy a bit. If not mistaken, this one is called Kuih Peria. Taste of Gula Melaka. Very nice. Not too sweet. Bought some of these oranges from the fruit stall nearby coffee shop. Super sweet. Then it was time to head back to the hotel where Mr Bala from the car rental company would be picking us up and send us to the airport. Anything that has durian, me loves!!! what a nice food trip! love the ice-cream, how bout the otak-otak? is it better here or at johor? You guys were the last group to leave Sibu. On last day there, Mamarazzi still able to buy quite a fair bit of stuff. Sounds like a really fun day! I want some of that ice cream lol! actually true also lah, when in a group need to "jao" everybody right?? when you are alone, you can do freely what you want to do with your own sweet time..
actually i'm curious about those worms leh.. so are they still alive and, i mean ALL of them the same count as you bought?? You guys really sampled the food in Sibu to the MAX!! Next time I go Sibu again, PAYONG will be the first place I have to go. You paparazi like otak-otak meh? Next time I make, I will call your mamarazi to come get some for your papparazi. Long time, I have not make otak-otak already. 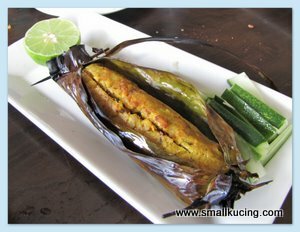 Johore otak-otak...Muar one lah - where got can compare to this? Best in the world!!! Penang's also...out! Many people do not like both...but this one, they keep coming back again and again and again to eat. Yum! YUMMMM!!!!! Thats some pretty lovely food, esp the pomelo salad and otak-otak. Sad to see that the midin did not last. Its one of my fav veg and just lovely to be fried with some garlic. The otak otak looks like a tamale! What did you do with the worms? Wah, sago worms survived the 2 hours flight? :P thought can't get through custom. then you must come and visit us. But all chau jor makan also cannot order a lot to share lo. Yes, the worms were alive but sampai KL some died.